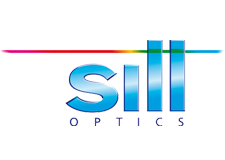 Sill Optics is one of the few medium-sized companies in Germany which has specialized in production of optical components of highest quality. Its philosophy: “100% Made in Germany”. Since its foundation in 1894 in Nuremberg enormous technical skills, extensive knowledge of manufacturing, as well as significant production flexibility has been established. Furthermore Sill continuously invests in latest production and testing technology. As a remarkable sign, that the word “precision” doesn’t mean just a slogan, the quality system is certified to DIN EN ISO 9001:2008 since 1996. Customized optics: Sill Optics has its own optical development department. This enables the design of optical and mechanical components optimized for the application of our customers. We produce prototypes in short time to a competitive price. Laser applications: Our product portfolio includes simple focusing lenses as well as beam expanders, standard scan lenses and a variety of telecentric scan lenses. These lenses are predominantly optimized for wavelengths in the range of 266 nm to 1090 nm. Aspheres: We offer standard fused silica Aspheres with 1“, 1.5” and 2” diameter and focal length from 20 mm to 200 mm. These are specially designed for the use with high power YAG Laser or Fiber laser. The reduction of optical surfaces and an optional low absorption coating minimize the thermal shift of the focus caused by the laser power. Industrial Image Processing: In this area Sill Optics offers various lenses in different quality levels to comply with the special demands in industrial image processing.